Cheesecake. I’ve baked, chilled and eaten so many different variations and interpretations in my life that I think I’m coming close to becoming jaded. Nevertheless, my family has a strange obsession for this dessert and requested it for Easter. In recent past I have baked Pierre Hermé Pastries’ Cheesecake Mosaïc and it was a hit. Frankly, I never really loved cheesecake until I baked that recipe. The intense pistachio flavor and the sharp poached sour cherries to brighten up the dessert. Most importantly, I don’t have to be anxious about the cheesecake cracking since the top layer is a mousse. 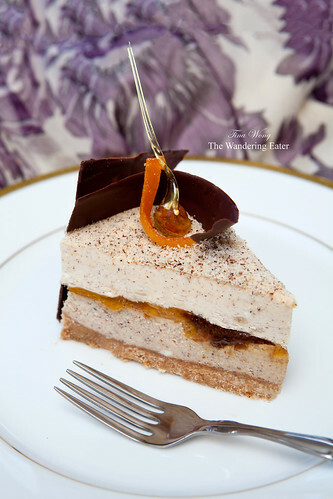 I wanted to make a variation of the Cheesecake Mosaïc but keeping it to its flavor ideas of a nut base accented by a tart fruit – and ended up with the hazelnut and yuzu. The smooth, somewhat malty flavors of the hazelnut praline (I used Love n’ Bake) worked with the layer of clean, bright yuzu marmalade (I used the one from Yakami Orchard). The swap from white chocolate to semisweet chocolate was necessary since the white chocolate would get lost in all these flavors. Like any cheesecake and especially an Hermé recipe, you’d need to allot some time from your schedule to build this dessert. My general suggestion is to make the chocolate squares and sweet tart base the night before (or even a couple days ahead of time since this dough freezes well) and the remainder of the cake the morning of. A few ingredients of the cheesecake filling and mousse recipe section I’m giving metric measurements with approximate volume since I recorded my changes in metric. As I’ve stated in the past, baking with weights is more precise than volumetric and a decent scale doesn’t cost you an arm and a leg – only about $20 at Amazon. Sift the crushed sea salt and reserve the smallest crystals, which will be used for the chocolate. Use a serrated knife, chop the chocolate. Melt the chocolate to 131°F (55°C) in a heat safe bowl set over a saucepan of simmering water (called bain-marie); the bottom of the bowl should not touch the water. Remove the bowl from the bain-marie and set aside until the temperature of the chocolate reduces to 55°F (27°C). Return the bowl to the bain-marie. Reheat the chocolate to the temperature of 86° to 91°F (30° to 33°C). Pour the chocolate onto the acetate strips. Using a long offset spatula, spread the tempered chocolate. Place another acetate strip on top, then a weight, to prevent the shape of the chocolate from warping. Refrigerate overnight. With a stand mixer fitted with a flat beater, beat the butter at medium-high speed until smooth. Add, in the following order, the confectioners’ sugar, ground almonds, and sea salt. Split the quartered vanilla bean in half lengthwise and scrape out the seeds. Add the seeds, egg, and flour. Beat until the dough forms a ball. Preheat oven to 350°F (170°C). Line the a baking sheet with parchment paper. Roll out the pâte sucrée beurrée to 1/16 inch (2 mm) thick on a lightly floured surface. Place the sheet of dough onto the prepared baking sheet. Bake for 12 minutes or until the dough is light brown in color. Remove the baking sheet and set aside to cool. Once the dough is cool, break the baked dough into pieces and place it into a food processor. Grind it into a powder, add the softened butter and blend until the butter is fully incorporated. It should look like a thick, light brown paste. Take the dough and spread the mixture evenly with your hands onto an unlined a 9-inch springform pan. Refrigerate for 1 hour. Lower the oven temperature to 300°F (150°C). Place the springform pan onto a baking sheet and bake for 12 minutes. Once baked, set aside to cool. Preheat (or lower, if the oven is still on) the oven to 194°F (90°C). Have a stand mixer fitted with a flat beater. Mix the cream cheese and sugar for two minutes. Add the flour, egg yolk, eggs, cream, hazelnut praline paste, and crushed hazelnuts. Mix until smooth. Pour the filling onto the cooled pastry base. Place it in the oven and bake for 1 hour and 15 minutes. Remove from the oven and set aside to cool completely. Once it is cooled, spread the yuzu marmalade evenly with an offset spatula. 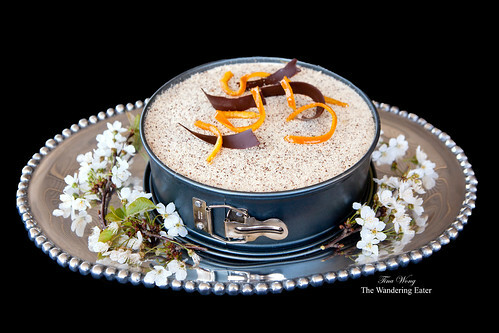 Refrigerate until the hazelnut praline mousse (below) is ready. Soak the gelatin sheets in cold water for 20 minutes. In a clean bowl of the stand mixer (fitted with a whip attachment), add the egg yolks and set aside. In a saucepan, boil the tablespoon of water with the superfine sugar to a temperature of 250°F (121°C). Turn on the stand mixer to a low speed and pour the boiling sugar syrup over the egg yolks in a thin stream then once finished pouring the hot sugar, turn on the speed to high for 30 seconds. Reduce the speed to medium to cool the mixture. Melt the hazelnut praline paste with the cream cheese in a bain-marie. Add the confectioners’ sugar, the drained and squeezed gelatin, beaten egg yolk and combine. Whip the heavy cream and fold it in. Remove the cheesecake from the refrigerator. Pour and spread the mousse evenly and freeze for a minimum of 3 hours. Before serving, unmold the cheesecake by heating the springform pan’s ring with a hair dryer or a blowtorch. Arrange the cheesecake on a serving plate and sprinkle the top of the cheesecake with ground hazelnuts. Break the tempered semisweet chocolate that was made the night before, into large irregular pieces. 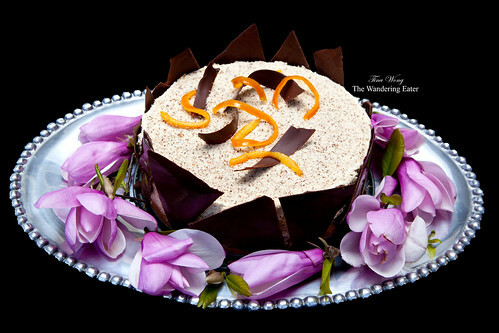 Place the pieces around the edge of the cheesecake and top with candied yuzu or orange zests. Refrigerate until ready to serve. La Maison du Chocolat's Duo de Ganache Tasting - This Monday! That looks absolutely stunning! Sounds like plenty of work but well worth it, have to try this soon. Thank you! It is a lot of work (more time consuming than physical work, imo) but it’s not as nerve wracking as having a cheesecake that have a huge crack in the middle.